No word on Destruct, but Tyrian has been ported to C and SDL as OpenTyrian so at least you can play Destruct natively without DOSBox. I cannot yet confirm this, but maybe at long last they’ve fixed the crashes and two-player keyboard conflicts. I still think a full rewrite would be incredible. Destruct was a secret mini-game hidden inside Epic MegaGames’s Tyrian space shooter for MS-DOS. It a clone of Scorched Earth, and probably the only live action clone of it that I have ever seen, with programs like Tanks and Worms sticking to little more than turn-based action. Destruct takes this a logical step further with frantic real-time play, as both players – one of whom may be the computer – rapidly cycle through their various units and available weapons to take out their opponent’s. The game also augments the genre with mobile craft such as the laser hopper and more notably the helicoper, a relatively weak vehicle (as you might expect) but capable of flying behind enemy lines and shooting at their gun installations from behind. Like any good Scorched Earth clone, the array of available weapons is large and diverse, and with some typically amusing elements. The repulsor is a huge electromagnet that will repel everything that moves, including artillery, laser bullets and helicopters, but not hoppers, whose x co-ordinate is fixed. Laser bullets, which do not obey gravity, can be turned around mid-air and back at the source, destroying it. The daftest weapon around is the dirt gun, which fires big chunks of mud that clog up the level. Rapidity of fire depends on the destructive potential of the gun, with the tracer shell giving a rapid stream good for tuning angles and velocities, and more powerful shells having noticeable delays between shots. Each type of unit in the game has a different set of available weapons and to select from as well as different armour strengths; note however that these are static properties and cannot be bought or upgraded, nor do they vary from level to level. Most units fire some kind artillery shells of varying strengths augmented sometimes with the likes of dirt and laser/plasma rounds; shells range in strength (and thus rate of fire) from micro (the smallest) up to large, then demolisher and finally small and large nukes. The basic gun turret for example has tracer, small, large and demolisher shells. It is typical for the behaviour of the unit types to differ between the left and right units, which can be perceived as handicapping the behaviour of one side’s variety. For example, the left player’s hopper fires MegaBlast (laser/plasma) rounds horizontally that will rebound of the screen edges forever, but the right player’s hopper fires MegaBlast rounds downwards for impressive aerial assaults. The left player’s rounds will typically bounce back off the screen edge and into their hopper, damaging them, although it can lay an arena of death for the opponent’s choppers. Explosions in Destruct are well done, however, being fiery infernos that incinerate the dying unit, and melting any other nearby units in chain reactions. Due to the random positioning of units frequently placing several units in close quarters, half the opponent’s forces can be wiped out in one go! 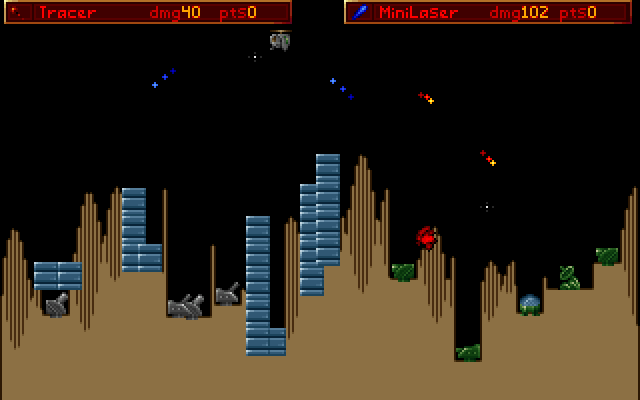 The landscape itself is mostly hills of soil, but the game also randomly places huge towers of metal blocks that are nearly impervious to fire, and will deflect standard laser rounds like a mirror (as will the boundaries of the screen). High-power laser rounds however will destroy metal blocks. The game also occasionally places hollow circles of “ground” in the sky for no clear reason. The strangest part of the landscape must be the small rocket-powered hovering devices that sit in the sky and do nothing except get in the way of fire. Normal artillery fire will exit the level at the screen edges but will bounce off the bottom as if it were a giant trampoline. The game plays as an endless sequence of random landscapes; each landscape is won when one player has no units left. A stalemate can arise however, if both players are left with just repulsors, which cannot do any actual damage by themselves! There are also five styles of gameplay that can be selected from a menu of: 5-Card War (the default), Traditional (one gun unit each), Heli Assault (the right player has all helicopters), Heli Defence (the left player – the computer by default – has all helicopters) and Outgunned (stronger weapons for the left player). The game did however have a number of unfortunate pitfalls, owing to being a secret game instead of a stand-alone release. Owing to what is presumably a limitation of the PC keyboard, a number of right-hand player keys trigger left-hand player actions such as fire their weapons, and consequently the right-hand player has to use sometimes unfavourable keys to avoid this. Like any complex two-player game, you run out of useful key assignments very quickly, something that network play can eliminate. The game would also lock up the computer once in a while, typically when exiting to the game type menu, for no apparent reason. Destruct is one of the most enjoyable games that I have played, and I would love to see it make a comeback as a stand-alone program, perhaps for Cy/VOS. Tyrian was still being worked on by a third party in 2002, World Tree Games, but development seems to have long since stopped with no-one around to simply cut Destruct out of Tyrian and release as an isolated game. This means that it would need coding from scratch and new music finding to replace Straylight Productions’s fantastic Tyrian soundtrack, which was played at random during gameplay. I am something of a stickler for not spoiling nostalgia with unwarranted changes, but at the same time, I believe that the game has room to grow, not only with significantly enhanced graphics but also in terms of gameplay itself. Quite how, I am not sure. Networked play is essential, if even to simply remove the issue of allowing both players to use sensible keys! A method is also needed to detect, or even resolve, stalemates, such as both players being left with nothing but repulsors.